Superb!! 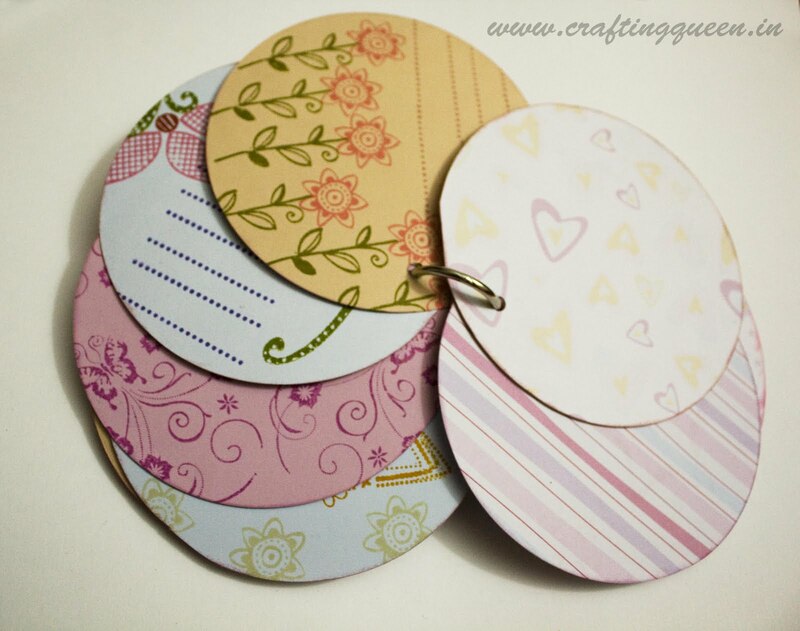 I have to get hold of my scrap CDs now...thanks for the inspiration!! 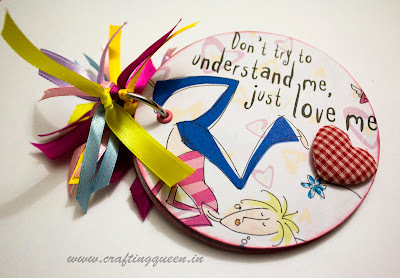 oh Mrs crafting queen.. You are making me J for the fact that you are sooooooo creative! its simply fantastic! How did u drilled the hole into the CDs? Awesome again! How did u punch the hole for the ring? Khush...kya comment hai...half of it is unfinished and is making my mind go everywhere else!! This is a beauty Karuna...love the mix of colors..and I think I have a dozen or so CD's too!! want some? how did ya drill the whole in cds ? Hey, this is so bright and fun! and i love that quirky sentiment on the front page :) I was planning to do a similar thing with all the CD's I have lying around. Thanks for the inspiration. this is just lovely u seem to have nailed the recycling theme,so much inspiration coming out of u it seems being the GT brings out the best in u:)beautiful project really!! Nice stuff.. It looks lovely!! Karuna I lovedays loved the cd case calendar-- fantastic idea.. How did you drill the hole in the Cds-- I find cutting them a big chore let alone drilling holes in them! 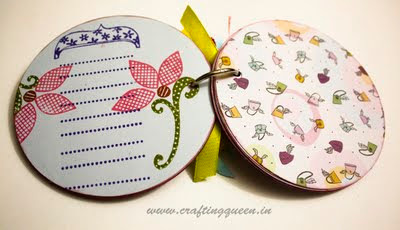 awesum creativity dear,same ques how u drilled the holes in the cds? wow this is gorgeous! u knw wht I threw a whole bunch of old CDs a few months ago :(, just hope I have few remaining to try this out! So clever! , I am always happy to see old CDs put to good use. Spectacular !! Love it ! Fabulous work girl :) Guess my fav work of you keeps changing with every new post. This is fabulous!!! :D LOVE it!